Day 31 : Getting our Puppet brains back in gear. So after a week’s break we are back to School; it’s only been a week but I’ve missed it. We have a whistle stop tour of all the movement and yoga work we have done with Rachel; which after a week off I was expecting to be sore from. We then spend the rest of the day recapping the work we did with Rene Baker on “Signs of Life”; some of the class had missed those workshop days so it was good to recap and help us all wake up our puppet brains after our week away. Taking elements of the three days we had with Rene; in groups we presented exercises which help show the aspects of Signs of Life. I was working in a group focusing on how to convey emotions/ attitudes through walks, using sticks; playing with rhythm and weight to aid in making the emotion clear. As well as waking up my puppet brain this was great for waking up my workshop delivery brain, working out exercises to timescales and how each activity runs into each other was great and a good reminder for me. It was nice to share with everyone our experience of the exercises and really helped to clarify some points. We meet Stefan Fichert from Figurentheater; Germany. Stefan presents us with a number of Projects which we will complete during our four days with him. 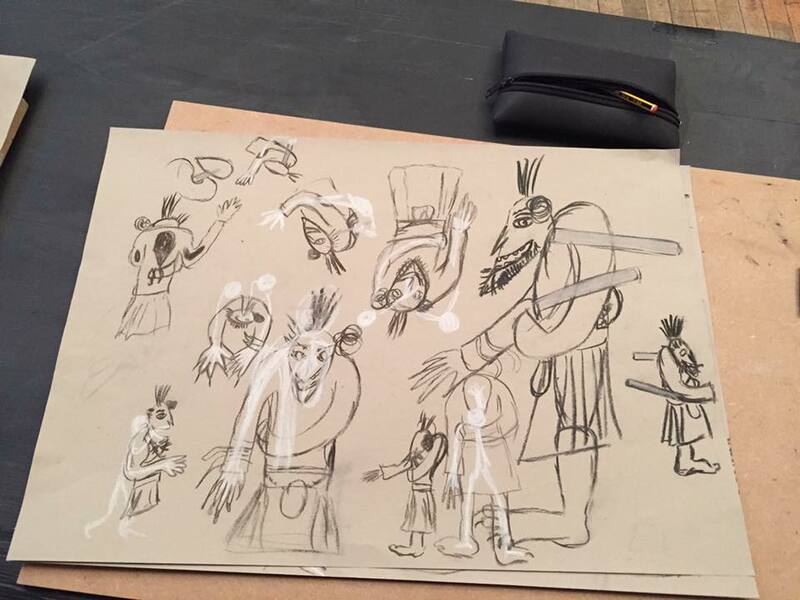 We are told to “FORGET PUPPETS!” We spend the first part of the day with charcoal, drawing round our hands and exploring the space in between; having fun and being free. Drawing from our own memories we do a form of brainstorming; with the initial seed of being asked to remember our first memory of saying farewell. We draw on the resources from our inner archives and draw all the images that come to mind from the memory. 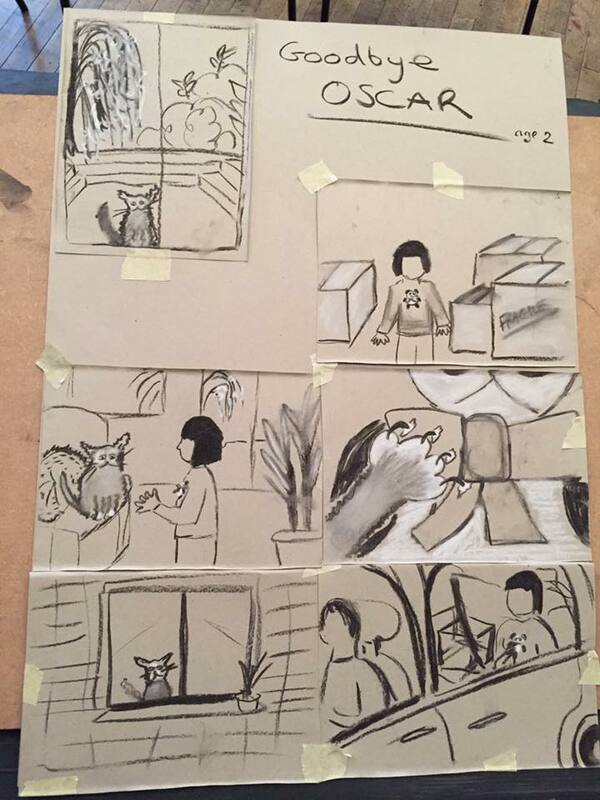 Once we have all the drawings out we begin storyboarding the memory into some kind of story. The story should be clear in its intention and the intention should be able to be understood. 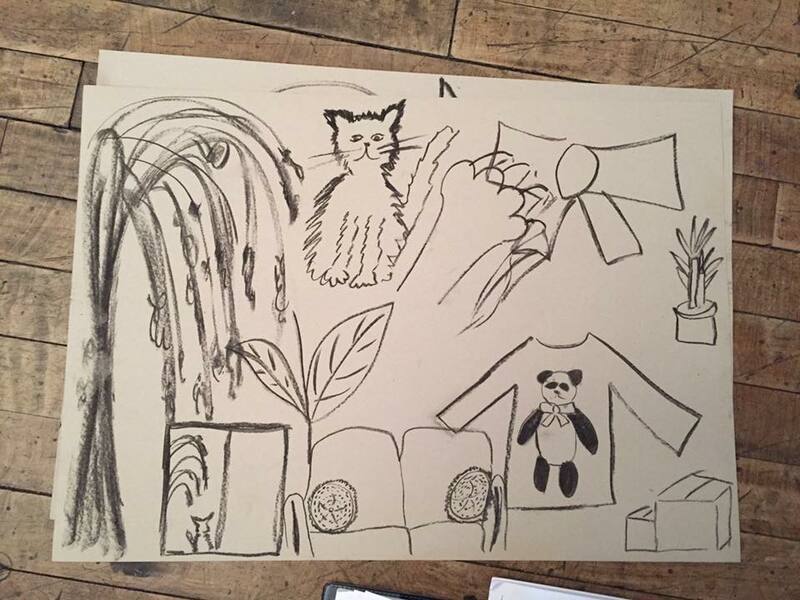 The visual brainstorming was an interesting way to begin; sometimes putting those first marks down on paper can be difficult; so having this bank of images was really useful. Stefan also asked us to pick an image from a selection he had brought (Paintings by well-known artists); choosing the one that we were most drawn to we then using it as inspiration we wrote a short story. Now a note to anyone who tries this, don’t start your short story in a rhyme; because that just adds another level of complication. Yes I wrote a short story in Rhyme, it was not intentional, but once you get into it you can’t get out; and to be fair I’m impressed that I managed to complete it. At the end of Yesterday we began another project, we were given bundles of photographs of animals (I had Wild Boar) from the photographs we drew studies, focussing on the elements that make up the animal, I spent some time looking at hair textures and direction, and the softness of the wild boars eyes, and finding the shape of the full creature. From these studies the next day we began by drawing the full creature; putting the photographs aside and only using the images we had drawn as reference. This was an interesting exercise as it allowed us to look at what actually makes up the animal, the important features and characteristics of it. 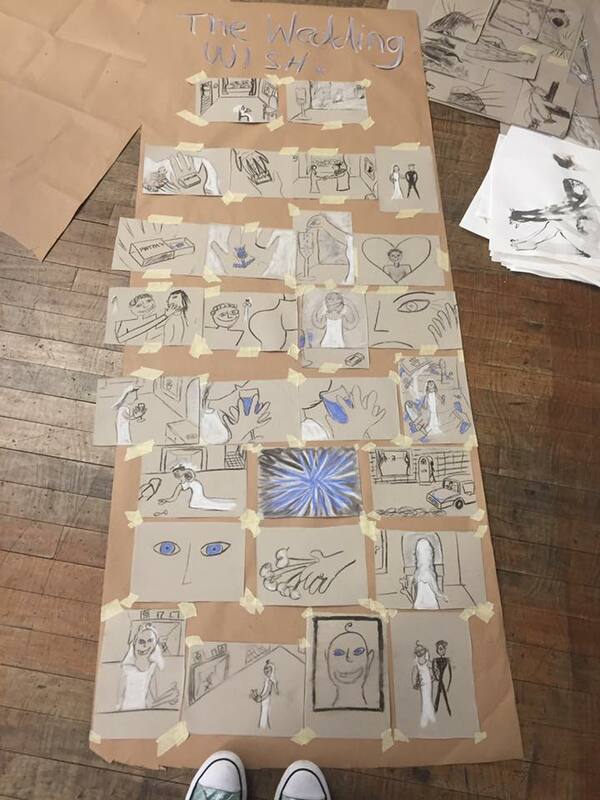 We then spent some time with the short stories, we swapped stories and shared them with the group, we were then asked to using the story we had been given break the story down into visual images and create a storyboard of it. It was interesting to see the visual interpretations of the stories, the authors of the stories were asked for their feedback on what had been created. It was amazing to see how the stories had been adapted visually how questions that perhaps the story itself hadn’t answered could be answered in an image. After reviewing the storyboards we had created; discussing the images that were missing and the interpretations the group had of the stories we moved on to creating characters. 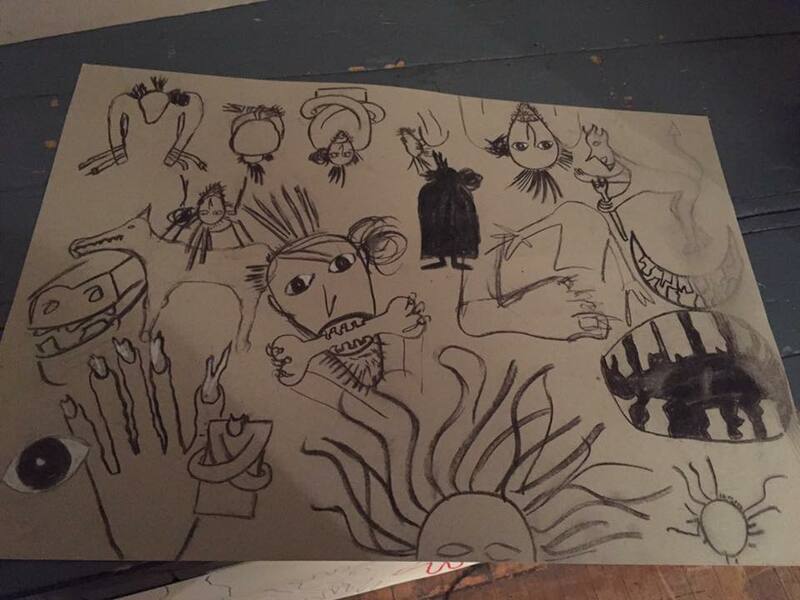 Stefan gave us a couple of pages of Nursery Rhymes and we were asked to select one; choose a character from it and using the brainstorming images exercise, draw out all the ideas then create a final drawing of the character. I read through all the Rhymes and there was one that particularly jumped out at me “The Mad Family” this rhyme is essentially about a Mad man and Family who ride to hell and the devil sends them out because they enjoy hell too much. When I read this rhyme the first thing I thought was this is a description of a clan, a clan that are worse than the devil. Ok so what I should disclose here is that I was involved with writing a musical about a cannibal clan from Scotland; and cannibalism can literally turn you mad. 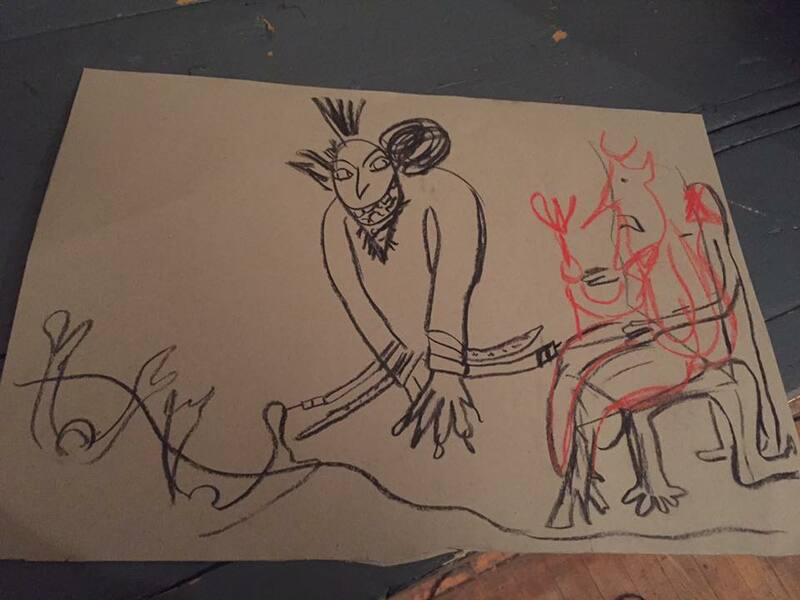 So drawing on some of those ideas I began to work on my character; who is worse than the devil and who is mad. I thought about straitjackets, I imagined that the characters nails would be long, probably broken and ragged from trying to tear at restraints. I decided that the character would have a fixed grin; because nothing is more unnerving than a smile that is unchanged no matter the situation. I chose a Kilt and straitjacket combo for their outfit, highlighting the clan element and the madness. I wanted their hair to be very striking, like they are constantly changing their mind about how it should look (probably because of voices). I’m very happy with the outcome, and although we were told to Forget Puppets, he has quite a puppet air about him. Day 35: What Kind of Puppet? Now we Remember Puppets! With our completed Character drawings, we are asked to make decisions of what kind of puppet this character might be; if we were to build them. For my Mad Man I considered a number of different styles of puppet, I first drew up ideas for a table top puppet using rods. I also dabbled with the idea of him being a giant puppet with multiple operators. Finally I decided to go with a human sized puppet which could have one or two operators, with a rod controlling the head and the arms of the puppeteers being the arms of the puppet; to allow the puppet to have very dexterous fingers. As the puppet is dressed in a straitjacket there would be the opportunity for one arm to be restrained whilst the other is free to allow for one puppeteer to manipulate the puppet. The legs of the puppet began to be less important and considered the puppet just being a torso wearing a straitjacket and not having a kilt, however after discussing this with Stefan he suggested that perhaps I could just loose the legs but keep the kilt as it would allow some movement and give the impression of a full body. 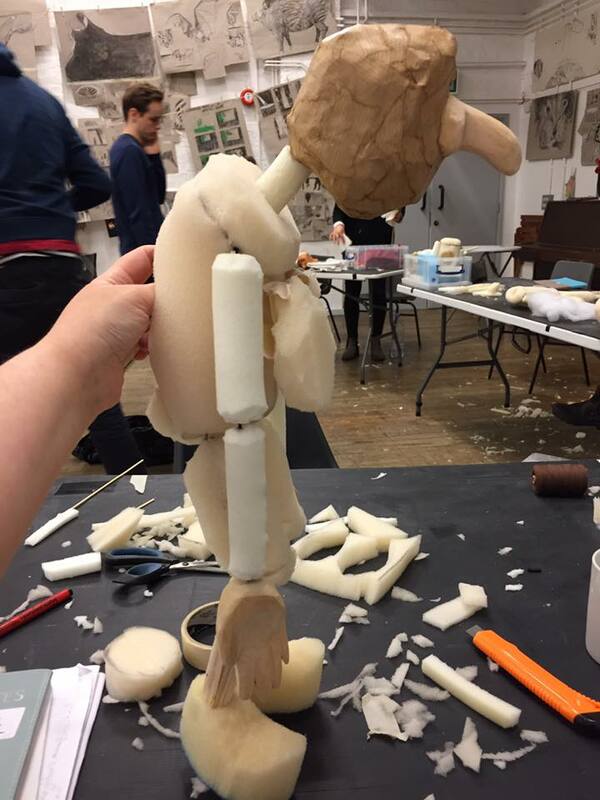 We carry on with the puppets we have been building; we are now at the point of building torsos, building up the shoulders shaping legs, and arms and basically getting them as complete as possible. My puppet has been gradually evolving; I didn’t have any particular idea from the offset what the puppet would look like. I started today by adding foam to the arms, and building up the shoulders. I rounded off the legs some more and added in some extra foam at the knees; as the knees were bending back a little. I then got to grips with the torso made from a sheet of foam, I decided to make the slant of the puppets shoulders very pronounced so as to elongate and curve the back of the body and shorten the front. I decided that the puppet would be an older female character and discussed with Lyndie about adding breast onto the character, she suggested that the breasts should have some movement and gave me some advice on how to do that. I cut into the shoulders to create a hole for the puppets rod (in its head), and added some foam to create a neck for the puppet. She is beginning to take shape, now I need to work on her face.